Rectangular curved washer, 3" x 4" with 1 1/16" diameter hole for 1" diameter bolt. Cast ductile iron material per ASTM A536. Galvanized per ASTM A-153. Rectangular curved washer, 2 1/4" x 3 1/2" with 13/16" diameter hole for 1" diameter bolt. Cast ductile iron material per ASTM A536. Galvanized per ASTM A-153. Rectangular curved cast washer, 3" x 4" with 15/16" diameter hole for 7/8" diameter bolt. Cast ductile iron material per ASTM A536. Galvanized per ASTM A-153. Square curved cast washer, 4" square x 11/16" thick at boss, with 1 1/16" diameter hole for 1" diameter bolt. Cast ductile iron material per ASTM A536. Galvanized per ASTM A-153. Square curved washer, 2 1/2" square x 3/16" thick with 11/16" diameter hole for 5/8" diameter bolt. Manufactured in compliance with NEMA PH-10. Galvanized per ASTM A-153 or ASTM B695. Square curved washer, 2 1/4" square x 3/16" thick with 11/16" diameter hole for 5/8" diameter bolt. Manufactured in compliance with NEMA PH-10. Galvanized per ASTM A-153 or ASTM B695. Square curved cast washer, 3" square x 3/8" thick at boss, with 11/16" diameter hole for 5/8" diameter bolt. Manufactured in compliance with NEMA PH-10. Cast ductile iron material per ASTM A536. Galvanized per ASTM A-153. 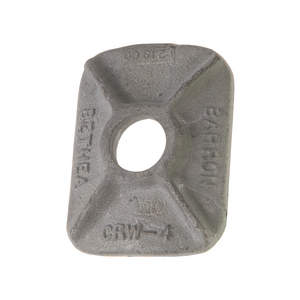 Square curved washer, 3" square x 1/4" thick with 11/16" diameter hole for 5/8" diameter bolt. Manufactured in compliance with NEMA PH-10. Galvanized per ASTM A-153 or ASTM B695. Square curved washer, 3 1/4" square x 1/4" thick with 13/16" diameter hole for 3/4" diameter bolt. Galvanized per ASTM A-153 or ASTM B695. Square curved washer, 3" square x 1/4" thick with 13/16" diameter hole for 3/4" diameter bolt. Manufactured in compliance with NEMA PH-10. Galvanized per ASTM A-153 or ASTM B695. Square curved cast washer, 3" square x 3/8" thick at boss, with 13/16" diameter hole for 3/4" diameter bolt. Manufactured in compliance with NEMA PH-10. Cast ductile iron material per ASTM A536. Galvanized per ASTM A-153. Square curved washer, 4" square x 3/16" thick with 13/16" diameter hole for 3/4" diameter bolt. Galvanized per ASTM A-153 or ASTM B695. Square curved cast washer, 4" square x 1/2" thick at boss, with 13/16" diameter hole for 3/4" diameter bolt. Manufactured in compliance with NEMA PH-10. Cast ductile iron material per ASTM A536. Galvanized per ASTM A-153. Square curved cast washer, 4" square x 17/32" thick at boss, with 15/16" diameter hole for 7/8" diameter bolt. Cast ductile iron material per ASTM A536. Galvanized per ASTM A-153. 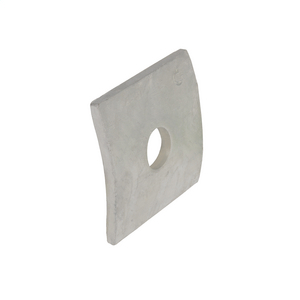 Square curved washer, 3" square x 1/4" thick with 7/8" diameter hole for 3/4" diameter bolt. Galvanized per ASTM A-153 or ASTM B695.